Today, we're talking to the authors of another Christmas novella collection--A Woodlands Christmas . First we'll talk to Ramona Cecil. How did your story for the collection come about? I actually wrote the basic story several years ago. In 2005, it won first place in a novel contest sponsored by the East Texas Writers’ Association of Longview, Texas. The Overton Window, the new political thriller by Glenn Beck. Though quite a departure from the Christian romance novels I usually read, I’m finding the book both riveting and informative. (A.) Larkspur, a romance set in an Indiana prairie settlement in 1835. It was published in 2006 by Vintage Romance Publishing after winning first place in their 2005 Vintage Inspirations Contest. (B) Brooksbury, an unpublished romance novel set in 1505 England. (C) London Holiday and Train To Eden, two unpublished contemporary romance novellas set in England. (D) Orion’s Daughter, an unpublished Christian historical novella set on an 1859 whaling ship out of New Bedford, Massachusetts. (E) Sweet Forever, Christian historical novel published in 2008 by Barbour Publishings’ Heartsong Presents line. (F) Everlasting Promise, Christian historical novel published in 2008 by Barbour Publishings’ Heartsong Presents line. (G) Charity’s Heart, Christian historical novel published in 2008 by Barbour Publishings’ Heartsong Presents line. (E), (F), and (G) comprise Freedom’s Crossroad, Barbour Publishing’s three-in-one collection of Indiana historical romances just released in May. (H) The Heritage, an unpublished full length Christian historical romance novel. (I) The Healing, an unpublished full length Christian historical romance novel. I’m presently working on another full length Christian historical romance novel set in 1870 and inspired by the history of the southern Indiana town in which I live. In my case, it was rewriting my already written story to fit the theme of the collection. My story, which was originally set near Dallas, Texas, had to be rewritten to fit East Texas, which has a much different topography and history from the northern central part of the state. I also had to write into my story the character of Gabe Noell, the itinerate woodcarver/preacher who appears in all four stories of the collection and make sure my description of him coordinated with that of the other authors. I really enjoyed it. It was fun to see how Darlene, Janelle, and Tamela wove their own Christmas stories around our common character, Gabe. My heroine’s name is Bridget O’Keefe. I knew I wanted her to be a petite red-head with green eyes and be of Irish heritage. I’ve always liked the Irish girl’s name, Bridget. I’m not sure how I came up with O’Keefe. I’m thinking I might have heard it on TV around the time I began plotting the story. My hero’s name is Seth. It’s a name from the Bible I have always liked, but had never used in one of my stories, so I thought this was a great place to use it. I wanted to give Seth a Germanic sounding surname because his backstory was inspired by the true story of the son of Goodleck Koozer of Henrietta, Texas. That holding grudges enslaves the heart and spirit, while forgiveness is freeing. Also, don’t fight against God’s will, because He always wants the best for us. Yes. I joined in 2002 because I knew I needed help and support if I was to ever realize my dream of becoming a published writer. As a writer of Christian fiction, ACFW was a no-brainer. I’m quick to testify that joining this group of wonderful writers—many of whom are now dear friends—was key in helping me on my road to publication. Two, really; have an open, teachable heart, and never, never, never give up. Thank you, Ramona. Now we're going to talk to Darlene Franklin. How did your story for the collection come about? I was intrigued by the idea of an artist searching for a woman with Mary’s face—and character (I had worked on earlier proposal with the same theme). So when we decided that each story would include an itinerant woodcarver, I knew he would carve a nativity set and my hero would paint Mary’s face. I’m reading the other Carol finalists in the mystery category (My books, A String of Murders, is a finalist as well). So I’m reading The Case of the Mystified M.D. by A.K. Arenz. I’m also reading The Crimson Cipher by Susan Page Davis, Dakota Cowboy by Linda Ford and Slightly Bad Girls of the Bible by Liz Curtis Higgs. I’d say that a fairly representative selection. I read mysteries for fun; romances for fun and business; and nonfiction for edification. I have several unpublished books, since I wrote about one book a year while waiting for that elusive first sale. Beacon of Love (one of three stories in the newly released Seaside Romance), a historical romance set in a Rhode Island light house during a hurricane. Prodigal Patriot, the first of three historical romances set in Vermont. Books 2 (Bridge to Love) and 3 (Love’s Raid) are on their way. Like Janelle, I had the privilege of writing for Heartsong Presents Mysteries. Two of the books have already been released: Gunfight at Grace Gulch and A String of Murders (the Carol award finalist). I’m hopeful that the third book, Paint Me a Puzzle, will come out next year. I’ve also been in two previous novella collections: Snowbound Colorado Christmas and Wild West Christmas. And I was in both of the last two collections with Darlene. What is the hardest thing about writing a part of a novella collection? Working with other writers always involves adjusting to everyone’s schedules and writing styles. But that’s part of what is wonderful about it. Together, we make a dynamic team! I was awestruck when I read our stories. Together, we have created a collection that will touch lives. It’s such a great way to invest in the lives of other writers. Given my take on the story of Mary and Joseph, I chose rather obvious names. My hero is Joseph “Joey” Carpenter. I used the nickname Polly for my heroine, Mary Jessup. I hope the readers will learn to look for character over outer beauty, and to seek to develop the qualities that set Mary apart for themselves. I joined ACFW in 2005. I guess I waited to see if this upstart organization was going to take off, and oh, boy, it did! (I’ve been writing since 1991.) It provides an international fellowship of writers who support each other. I learn, I fellowship, and I keep up with trends in my profession. If you’re a writer of Christian fiction, you should belong to ACFW. It’s as simple as that. Perhaps it’s to grow tough skin. Rejection and bad reviews are part of every writer’s life. Thank you, Darlene. Janelle Mowry is coming up next. How did your story for the collection come about? I had a story idea sketched out but had yet to start writing it. When we decided on our story theme, I adjusted the story to make it fit. LOL. Believe it or not, I’m reading Dwight Swain’s Techniques of the Selling Writer. I feel it never hurts to refresh one’s memory about proper writing techniques. I’ve written a three book series, The Colorado Runaways, for Harvest House, the first titled When All Your Dreams Come True to be released Feb. 1, 2011. Books 2 and 3 of this series will also be released in 2011. 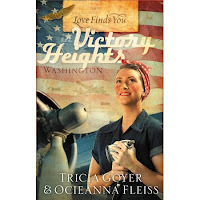 I’ve also written Love Finds You in Silver City, Idaho, for Summerside Press to be released Oct. 1, 2010. I’ve also co-authored a three book mystery series, Massachusetts Mayhem Mysteries, with Elizabeth Ludwig. The first book, titled Where the Truth Lies, was published in 2008. Books 2 and 3, titled Died in the Wool and A Black Die Affair, will release in 2011. I’ve written three other stories, two of which will probably never see the light of day. The other may find its way back to my computer screen one day. The hardest part for me was making sure the character who appears in each of our stories both looked and sounded the same. But the ladies I worked with are great and simplified the task. They taught me how to write much tighter, how to find the sentences that weren’t necessary and delete them without too much pain. This was the first short story I’d ever written, so new lessons were involved for me. Tamela, Ramona, and Darlene were great to work with. Sometimes I use names I’ve always loved. Other times, I try to make them sound like the region they’ve come from. For my heroine in this story, I wanted a southern-sounding name, which led to Emma Rose Pickett. It just seemed to fit. I hope the readers will learn that anger and vengeance only hurts the one holding tightly to them. That walking in God’s will with a spirit of love and forgiveness brings freedom and healing. I joined ACFW in 2002 after an author I’ve admired for years told me about the group. The authors taught me much and what I learned was a significant part of my journey to becoming a published author. Besides the need to join ACFW? Never stop learning. Thank you, Janelle. Now I'm going to talk Tamela Hancock Murray, one of my favorite people. How did your story for the collection come about? I love how Gabe is present through the book, and I felt led to write about him as a long-lost grandfather. Often people inspired by great preachers don’t think about the fact that the ministers have family lives, too. Since Gabe is mysterious, I thought readers would be interested in learning more about Gabe and from whence he came, since for this set we had decided not to go with the “Is he really an angel?” route. In additional to my devotional reading, I’m one of those crazy people who reads several novels at once. I’m reading THE GLASSBLOWER by Laurie Alice Eakes, A PROMISE FOR SPRING by Kim Vogel Sawyer, and next on my list is BECOMING LUCY by Martha Rogers. I am proud to be a literary agent with Hartline Literary Agency, and I am blessed to represent all three of these authors. My credits include many novels, novellas, and some Bible trivia bools. I invite you to find out about them at: http://www.tamelahancockmurray.com/. I am excited that two of my Bible trivia books, BIBLE SURVIVAL and LOST AND FOUND, have just been reissued as a set in one book. I am honored that my most recent Heartsong Presents novel, THE MASTER’S MATCH, was among readers’ top picks for the year. The cover also received recognition. I am grateful to the talented people who put together such beautiful artwork. Writing about settings other than where you grew up or where you have travelled often presents a challenge to me. I want to be sure to make the setting as authentic as I can, at the very least including landmarks and appropriate plants, birds, and temperature. I have enjoyed visiting Texas but for me, writing the setting wasn’t as organic as writing about my home state of Virginia. For example, I’m cold-natured so my impulse when writing about winter is to have everyone bundled in heavy coats, maybe even fur, but the part of Texas in question here meant people dressed for moderate winters. I am so blessed to be friends with all my collaborators. The set went quite smoothly. It’s great to work with professionals such as Ramona Cecil, Darlene Franklin, and Janelle Mowery. We chose the last name to fit the Christmas theme, and Gabriella is named after her grandfather, Gabe. I try to stay with the time period for all my characters. For example, if I am writing a story set in 1880, I try to find popular baby names for the year 1850 or 1860. I have several books to help me. Yes. They are a great organization comprised of many publishing professionals. I like that they welcome beginners as well as people who’ve been in the business for decades. Some organizations have such stringent rules for admission that gaining entry is next to impossible. Other organizations charge high fees for admission. Since so many CBA writers are in ministry, this can be a burden. I appreciate ACFW’s openness to all types of writers, and the fact that for most people, dues are affordable. I also appreciate that they run critique groups, a prayer loop, a main loop, and other loops and forums to help people who want to focus on a specific need or topic. They also run a top notch conference each year. Write 1000 words a day. If you do, you will complete a trade-length novel in three months. I honestly can say I don’t set out to include myself in my characters. Because of my life’s experiences and perceptions, I couldn’t write a character without something of myself in them, but I try to make each character different and unique and that means they have to possess a variety of characteristics. If anything, I try to write characters that have features I would want to have or that I admire. Unless of course, it’s the bad guy. That said, though not done intentionally, when I finish a book and evaluate the spiritual struggle of the main character I am surprised to see issues I am either struggling with and or have recently come through. Though Christian fiction entertains, and some would say that is the only purpose of fiction, God can really help us develop our spiritual walk through great stories. I so agree. What is the quirkiest thing you have ever done? Laughing and enjoying all the fun memories this question brings to mind. Hmm, now which one do I want to be publicized on the internet? When I was young, there was a contest to stretch Slow Poke suckers. These were hard taffy suckers that could grow to incredible lengths if you worked on them for hours. So I did and sent them a letter with the length of my sucker—don’t remember how long it was now—and received an award from the Holloway Candy Company for my achievement in stretching a Slow Poke sucker to extreme lengths and the title of Super Sucker Stretcher. I still have the letter from the company. I loved Slow Poke suckers. When did you first discover that you were a writer? Wow, that’s a tough question. I always wanted to be a writer, but I guess I really felt like one when I started submitting work to agents and publishers for publication. Then when I finaled in a few contests and an agent accepted me as a client, my writing was validated enough for me to say I am a writer. For entertainment, I read in the suspense genre. I love a good mystery, thriller and romantic suspense and is attested by my selected writing genre and my book review website, http://www.thesuspensezone.com/ . I also like to read books related to writing fiction, and inspirational non-fiction books to challenge and grow my faith. I guess the key would be balance. Not going overboard on any one thing or trying to do too much. Lately, I’ve been struggling with getting all the things done that are expected of a published author, promoting two books that are releasing this fall and working on edits for my third book due out in 2011. But recently God reminded me of what is important and what my priorities should be, bringing me back into focus. The first thing I start with is the era in which the character was born to make the name appropriate to the age. Then I look at ancestry to see if that is an important focus for that character. If it’s a minor character, I may use a random name generator. I also try not to use characters whose name start with the same letter or sound similar to not confuse the reader. Though, I don’t think of this as an accomplishment per se, I am proud of my two daughters. Of the women they have turned into and of their walk with the Lord. It’s hard to raise godly children these days with all the competing noise and distractions and the fact that faith is so important to both of them makes me so happy. Hmm, I would have to be a house pet as I don’t like roughing it. At first I wanted to say a dog because I love dogs and they are, after all, man’s best friend. But then I thought about what life was like for our dog and decided on a cat because when nature calls they don’t have to go outside in the rain and snow. They also stay up all night and rule the roost they live in. But, wait, they like mice and I so don’t like mice. Is it too late to change my mind? Sweets of pretty much any variety are what I like best. If they involve chocolate all the better. The life-long love of reading inspired me to want to write a book, but it was God who arranged free time for it to happen. I’ve always enjoyed writing from creative to technical writing I’ve done in the corporate world, and I said for years that I was going to write a book, but I was so busy working full time, raising children, and volunteering at church that I never made the time. Then in 2000, I began having health issues that limited my physical activity. Forced to sit for long periods of time, I started to research the craft of writing and began my first book. As my health deteriorated, I had more and more time available and soon I was writing fulltime and actively pursuing publication. I continued to work on the craft and to submit books, got the requisite rejections and then in the fall of 2008 at the ACFW conference, I was awarded a book contract in front of 500 or so of my fellow writers. My agent, crit partners and the editor had conspired to keep this a secret from me for five months. Since then I have contracted additional books in the Steeple Hill Love Inspired Suspense line and look forward to writing for years to come. My greatest roadblock or challenge is crafting that all important first chapter and not rewriting it a zillion times. I can spend more time on that chapter than the rest of the book. And note I’m not talking past tense here as I haven’t really overcome it. But, if I am to meet my word count goals, I will have to stop being a perfectionist. We’ll see how it goes. If being published is your dream, don’t give up. Ever. No matter what setbacks may occur. But search deep to learn why you want to be published so you understand your motivation. In The Fire in Fiction, Donald Maass talks about two kinds of writers and I will very badly paraphrase him here. One type of writer is only seeking publication because they want to see their name on a book and is unwilling to do the work that it takes to become published. The other type of writer writes because they love to tell stories and want to do nothing else. He calls them status seekers and storytellers. Deciding early on which one you are may make the process easier. 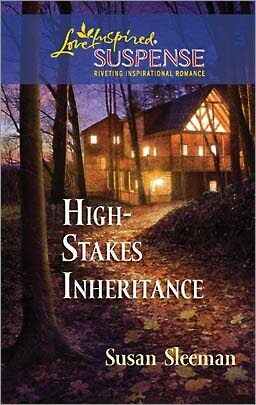 High-Stakes Inheritance is a romantic suspense book published by Steeple Hill’s Love Inspired Suspense line. In High-stakes Inheritance, family counselor Mia Blackburn’s Uncle Wally dies and leaves behind a will that requires her to return to Logan Lake, Oregon, to live at the rustic Pinetree Resort for one full year in order to inherit the valuable property. If she fails to stay at Pinetree for the full year, the property reverts to her brother. But on her first day in town she receives a threatening message: Leave Logan Lake or you will pay. Despite the warning, Mia won't let anyone scare her from the rustic resort. But when a fire traps her in a burning barn, she fears that she won't get out alive. Just in time her ex-boyfriend volunteer firefighter Ryan Morgan rescues her from the deadly blaze. He had once broken her heart, yet she still has feelings for him. With Ryan insisting on keeping a close eye on her, Mia feels safer-and closer to Ryan than ever before. Yet the threats haven't stopped, and soon Mia's high-stakes inheritance includes a murder-and Mia could be the next victim. Pinetree will never be yours. Leave Logan Lake now or you will pay. Mia Blackburn stared at the cutout magazine letters glued to stark white paper. Was this some kind of a joke? Did someone really plan to hurt her for honoring her late uncle's wishes? To meet the terms of his will, she had agreed to live at Pinetree for the next year in order to inherit the resort. Yet nothing about the idyllic Oregon setting and worn cabins would garner this kind of threat. With trembling hands, she flipped the envelope and searched for clues. The hate mail held a postmark from three days ago right here in the Logan Lake Post Office. She rubbed a finger over the neat rows of shiny magazine letters. Anger seemed to leap from the page. Her mouth went dry, and her throat tightened, nearly cutting off her air. Only one person harbored such bitter feelings for her. Her father. And knowing him, he'd lurk in the shadows to see her reaction to his threat. The space seemed to darken with her thoughts. Was he here, in the room watching her? Or would he be outside on Main Street, sitting in his Cadillac, drumming his fingers on the wheel as he did whenever he grew impatient? Sounds intriguing. How can the readers find you on the Internet? I can be found at the following places. Readers, here's a link to the book. By using it when you order, you'll help support this blog. 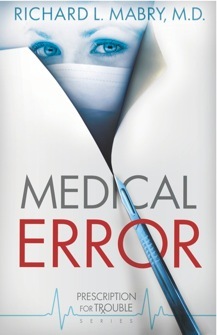 I'm thrilled to feature Richard with his new book Medical Error. I read the ARC and loved it. I wrote a review of the book. Click on the tab at the top of this page that says Reviews - Books I've Read and go down the page until you find it. Welcome, Richard. Why do you write the kind of books you do? 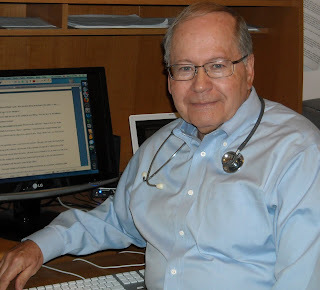 I practiced medicine for over four decades, so it’s no surprise that my novels have a medical setting. I’ve been reading suspense all my adult life, and I’ve learned a few things about it along the way, so I write suspense. You can take the “with heart” a couple of ways. There’s a bit of romance, although not enough to make the male audience put down the book. But my work also features the love God has for His children. And that’s important for me to communicate. And you do it so well. Besides when you came to know the Lord, what is the happiest day in your life? God has given me so many great days that it’s hard to choose. I suppose I’d pick the day I first held my granddaughter. Yes, holding each grandchild for the first time is like touching heaven. How has being published changed your life? It has validated the call I felt when I attended my first writing conference. I went there thinking I’d like to write a non-fiction book after the death of my first wife. The publication of that book, The Tender Scar, fulfilled that particular dream. But the subsequent publication of my novels, Code Blue and Medical Error, makes me more certain than ever that God has called me into this endeavor after my retirement from medicine. I tend to re-read the works of some of my favorite authors in order to keep my own writing fresh. I’ve just finished a legal thriller by John Grisham and a medical thriller by friend/fellow physician Michael Palmer. These are in addition to the “to be read” pile of books by my fellow Christian fiction authors. I'm interested in it already. What would be your dream vacation? Two weeks with Kay on Maui, with no cell phone or Internet access. As much as anything, it has to do with my familiarity with the region and what fits the book’s plot. My first book was set in a smaller town because that contributed to the tension of the plot. My second book was set in a larger city—Dallas—because it offered more opportunities for me to exploit the setting. I agree with you. I just finished teaching a workshop in Shreveport yesterday on Taking the Setting to the Next Level. If you could spend an evening with one person who is currently alive, who would it be and why? My pastor, Chuck Swindoll. Not only is he a fantastic preacher and wonderful Christian, I think he has more and better stories than anyone I’ve heard. That would be golf. I’ve had a standing golf date every Wednesday for many years with my friend and attorney, Jerry Gilmore. We’ve consoled each other through the death of our spouses, congratulated each other when God blessed us again with the love of wonderful women, and maintained our friendship whatever the circumstances. Oh, and we don’t keep score! If I played golf, that's the way I'd want to play. What is your most difficult writing obstacle, and how do you overcome it? Sloth! It’s nice outside. There’s a book I want to read. I’d like to see a movie. But instead I have to write. How do I overcome it? Like anyone else, I just do it. Apply rear end to chair, write, revise, keep at it. Lather, rinse, repeat. Learn everything you can about the craft. When you think you know it all, realize you don’t, so keep studying. Practice, practice, practice. Get your work critiqued by someone who knows whereof they speak (not your Aunt Erma, she’s prejudiced). And don’t give up. God’s timing isn’t ours. Dr. Anna McIntyre’s life was going along just fine until someone else started living it. Her patient died because of an identity mix-up, her medical career is in jeopardy because of forged prescriptions, and her credit is in ruins. She thought things couldn’t get worse, but that was before she opened the envelope and saw a positive HIV test with her name on it. Her allies are two men who are also competing for her affection. Dr. Nick Valentine is a cynic who carries a load of guilt. Attorney Ross Donovan is a recovering alcoholic. The deeper Anna digs to discover who’s behind the identity thefts, the higher the stakes. Finally, when her life is on the line, Anna finds that her determination to clear her name might have been a prescription for trouble. My website is http://rmabry.com. I blog twice a week at http://rmabry.blogspot.com/. Lena, thanks for having me as your guest. I hope your readers like Medical Error. I'm sure they will. Thanks for sharing it with us. AnnetteW is the winner of Licensed for Trouble by Susan May Warren. Deanna is the winner of Tomorrow We Die by Shawn Grady. Nise' is the winner of Surrender the Heart by M L Tyndall. Desiree is the winner of Let the Children Come to Me by Sabrina Li. Jan Cline is the winner of Baby Makes a Match by Arlene James. Dawn Ford is the winner of Making Waves by Lorna Seilstad. I'm so happy to welcome Tessa to the blog. Tell us how much of yourself you write into your characters. A bit of me leaks into most of my characters, I think. My personal experiences tend to inform my writing, because I believe in the maxim, Write what you know. However, that’s not always possible when writing historical or biblical fiction; I am relieved to say that I don’t know what it’s like to be forced into prostitution, for example. But I do know what rejection feels like, and I use that knowledge as a steppingstone into Rahab’s heart. Becoming a Christian is pretty quirky. I remember when I was eleven, I wrote a short story in one sitting; I can’t even remember the plot line anymore. It was the first story that I asked my father to read, because his opinion was so important to me, and I wanted to wait until I had just the right story. When he finished it, he had tears in his eyes. “Did you really write this?” he asked with wonder. None of the accolades I had received at school made me feel half as good as that moment. I knew I was a writer then. By my dad was also an incredibly practical person, so I grew up believing that being a ‘writer’ meant having a hobby. Jane Eyre is one of my all time favorites, too. I just reread it this year. How do you keep your sanity in our run, run, run world? Keep? I think it’s too late for that! Reading is a wonderful way of holding on to the last dregs of sanity though. It’s the one activity you have to be still for. You can’t really multi-task with reading. You have to be still and focus on this one magical world that someone else has created. Bliss. That, and eating slowly. I love to take my time over food. In historical and biblical fiction, one doesn’t have much choice. Rahab, Salmone, and Joshua were already part of the story. I try to do research into the time period for the other characters’ names. The novel I am working on now is set in ancient Persia during the time of Nehemiah. I wanted to name my main character Leila, because it’s a Hebrew word meaning /night/. But I found no evidence that this was a name used at the time amongst the Jews. So I called her /Sariah/ after a woman who was the wife of a soldier in a Jewish garrison close to this time period. Naming my hero has been even harder. Ancient Persian names are hard to pronounce! No wonder the Greeks complained so much and changed them all. Getting through yesterday while clinging to Jesus? Every day is an accomplishment to me—at least everyday I trust in God and choose to believe Him over the lies of this world. O my, Lena. No one has ever asked me that. Let me see: Jesus’ pet lamb? For obvious reasons. Sounds good to me. What is your favorite food? Medium rare steak and homemade French fries with a lightly dressed green salad. My concentration is totally shot now; all I can see is that thick, juicy steak. Can you smell it? My husband hasn't been able to eat a steak for over a year, so I haven't either. Now I'm craving one. What is the problem with writing that was your greatest roadblock, and how did you overcome it? What has surprised me about the process of writing is that most of my experiences of rejection have been internal. Many times, I have had to battle the forces of discouragement as I write, so I am astonished at the doors God seems continuously to open. I think this is a skirmish that I’ll have to face again. My heart is susceptible to self-doubt. But Jesus is greater than my heart. I don’t stand on my gifting or my strength, which are both limited; I take my stand on Him who holds my future. Or at least I press on toward that goal. 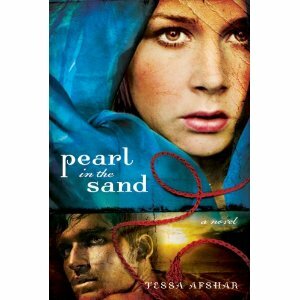 Tell us about Pearl in the Sand. Pearl is based on the story of Rahab, the Canaanite harlot who is famous for having saved Israel’s spies from death. She then went on to marry one of the leaders of Judah, and is in the lineage of Jesus. Think about that: some of the DNA of this former harlot swam in Jesus’ blood stream! This is the story of a woman whose world was a mess, whose life was a mess, whose heart was a mess, but in encountering God, she found to her shock that her life was salvageable. More than that—it was valuable. She found that she was lovable. For her, this process happened through the love of a godly and persistent man who was nonetheless, flawed. God started the most significant part of Rahab’s life by literally pulling down the walls of her home around her. As traumatic as that moment must have been for Rahab, she could not have moved on to the future God had planned for her without it. 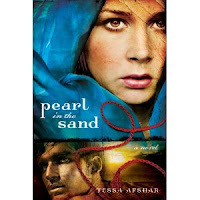 In a parallel pursuit of healing for her broken soul, /Pearl in the Sand/ portrays a God who just as determinedly set out to ruin the walls surrounding Rahab’s heart. I think women today need to know God as the wooer and pursuer of their hearts. They need to know that sometimes the most glorious breakthroughs of life come through a vector of God-ordained pain. More than anything I hope the reader of this story will come away with a deeper glimpse into her own soul, and a more profound understanding of God the Father. If you go to my website at tessaafshar.com, you can read the whole first chapter. Even the second chapter is available under the Free Downloads tab. If you are interested in a little more interaction with me, please join me on my Facebook Author Page. I would love to have you along for that fun ride. Thanks so much for inviting me to be a guest on your great blog, Lena. You ask really fun questions! And you gave very thought provoking answers. I've loved having you. 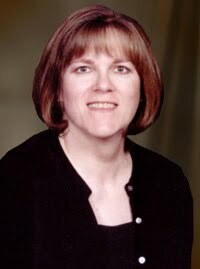 Bio: Maureen Lang is a multi-published author of romantic historical and contemporary fiction. 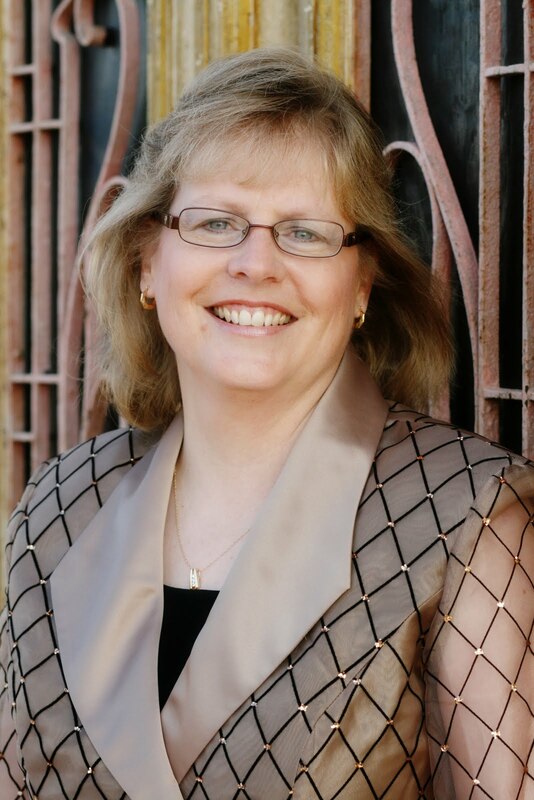 She is the recipient of RWA’s Golden Heart Award and ACFW’s Noble Theme (now the Genesis) and winner of RWA/FHL’s Inspirational Reader’s Choice Contest. 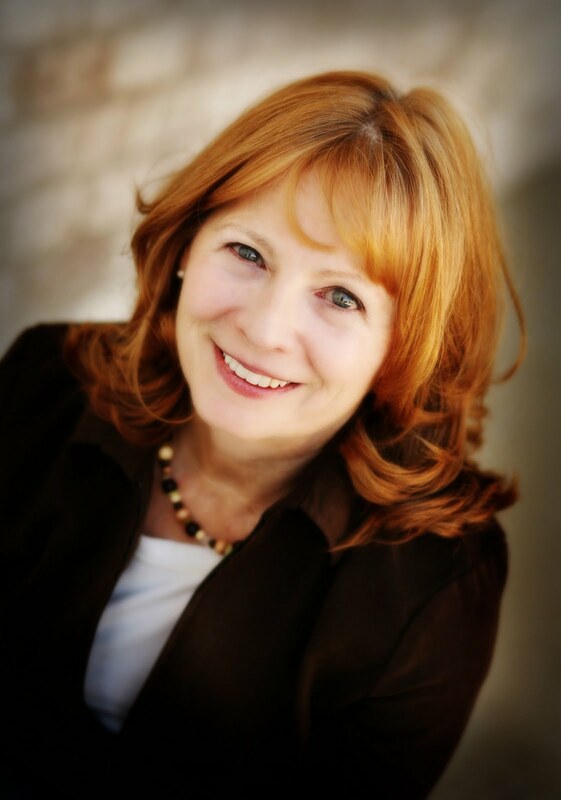 Maureen has also been a Christy finalist, multiple-time finalist in ACFW’s Book of the Year contest (now the Carol Award), as well as finaling in various RWA Chapter contests including the Gayle Wilson Award of Excellence Contest, the Holt Medallion, and others. She lives in the Midwest with her husband, two sons and their lovable Lab. So glad to have you back, Maureen. Tell us about your salvation experience. When I was in Middle School (back then they called it Jr. High) I was already writing stories. As it happened, one of my characters used to like to quote the Bible. However, being from a family who didn’t read the Bible, I had no idea where to start. Like many families of the late 1960s and early 70s, we did own a copy of the Bible—but it was just a nice dust collector. So I brushed it off and started reading, looking for wisdom, wit, and even judgment that this particular character might use around other characters in my book. Well, one day while I was reading this Bible, one of my older brothers came home for the weekend from college. While away, he’d been challenged in his own faith—or lack thereof—by a group affiliated with Campus Crusade for Christ. He talked to me about what the Bible was really for—not just research for one of my stories, but the actual Word of God—and that was the beginning of my life being changed. I always found it interesting that God kind of “warmed me up” through a character in one of my novels. I guess He knew how to reach me, didn’t He? That's why we shouldn't put Him in a box. He know just how to reach each of us. You’re planning a writing retreat where you can only have four other authors. Who would they be and why? Sounds like a retreat I'd love attending. Thanks for including me. Do you have a speaking ministry? If so, tell us about that. I’ve spoken a few times at Ladies Retreat events and a couple of writer’s conferences, but it’s not something I do very often. I’ve never really felt that teaching is my gift, since I prefer to stay home and write. It’s also hard for me to get away, having a child with a disability who basically needs round-the-clock attention. I do have people mentioning that to me, and one of the first things I try to find out is if they’re really serious. Many people have a desire to write but with little actual intention to follow through, even though computers have made writing so much easier. If they’re a dabbler, I encourage them to continue to explore writing because I believe it’s a wonderful way to connect not only with our own thoughts and emotions but with God. But if they’re really serious about writing—let’s say I’ve met them at a writer’s conference, so they’ve already invested some time and money into this endeavor—I encourage them to read voraciously, everything from the genre in which they hope to sell something. A market study is a great place to start, especially reading the work of new authors who’ve recently broken into print. See what works, try figuring out why their book was chosen. I also encourage them to find a critique group, either in person or online or both, enter writer’s contests in their appropriate genre (unbiased feedback is worth the entry fee, whether or not their submission becomes a finalist or wins). And if I haven’t met them at a conference, I counsel them to attend one that offers appointments with agents and editors. Meeting someone in that venue is invaluable, especially in this day and age when so few editors are open to looking at something without an agent, and agents are nearly as hard to connect with as an editor. I always finish by saying that although I love writing, only a small percentage of writers ever get to be published in the traditional way. It takes every bit as much perseverance as talent (perhaps more). In fact, I usually try saying that if there is anything else they’d like to do as an outlet for their creativity, perhaps they should do that if they aren’t prepared for rejection, discouragement, and little job security which unfortunately are the foundation pieces in the business. That just sounds like a bundle of good news, doesn’t it? Sometimes writers are called to write, but it’s hard to say how God will bless that particular gift. Enjoying it as something that draws us closer to Him is a good thing to keep in mind. Whisper on the Wind is a story of love, action and adventure, and all about the power of words. In the middle of World War One, Isa sneaks inside German-occupied Belgium to smuggle out the man she’s always loved. But Edward refuses to leave. He’s involved in a secret newspaper, one that is a lone voice of hope to a city occupied by the enemy. Soon Isa is caught up in the uncensored newspaper, too—but is she doing it because she believes in the cause, or just to get Edward to notice her? Edward Kirkland kicked through the ashes, staring at the black dust as if seeing what it had been just yesterday: his home. All that was left was a pile of charred ruins amid the shell of the hotel his father had managed. And there, not far in the distance, was the university. He could see the vestiges of the library from here, with nothing but rubble in between. Compliments of the German Imperial Army. There wasn’t a thing Edward or all of Belgium could have done to stop it. Not that they hadn’t tried, but a mouse couldn’t fight an eagle. Edward turned to leave. He shouldn’t be out anyway, with German soldiers still roaming the streets, keeping the peace they’d broken with their arrival. He needed to return to his mother and brother in hiding at the church. Something on the ground glimmered in the faint afternoon light. Though he stopped to investigate, scraping away fragments with the tip of his shoe, Edward knew nothing of value was left. Before they set the fire, the Germans had carried anything of worth out to a waiting cart to be shipped to Germany as spoils of war. Then he saw the rose and a flash of silver light. With a lump in his throat, Edward bent and picked up the picture frame. He saw that the glass was broken and most of the photo burned away . . . except for the middle, where a shard held it intact. And there, smiling as if the world were a happy place, was Isa Lassone’s face. Isa, his mother’s young charge, who’d fled with her parents before the invasion. She was safely ensconced in peaceful, prosperous America. She had both her parents, both her silly, selfish parents, while his father lay dead and the remains of their home smoldered. The picture might have fallen without the glass holding it down. Bracing the photo in one hand, with the other he brushed away the broken pieces. He should let it go, let it join the wreckage of his home. But Edward’s thumb pressed it back into place, firmly within his grip. Slipping the frame into the pocket of his coat, he made his way through the brightening streets. The ground was strewn with debris—bricks, glass, even a stinking dead horse here and there, the carcass oozing under the early August sun. Half the city was gone, along with Edward’s father. Shooting and looting had lasted all night, but he’d had to see the hotel and university himself before he’d believe that they, too, had succumbed to the fires. Something inside told Edward he should pray, reach out to God to help him face this day. That was what his father would have done, what he would have wanted his son to do. Edward turned up the collar of his coat against an ash-laden breeze and walked away, trying not to think at all. Edward did so because to refuse a soldier’s orders was to be shot. He’d seen it done. Edward raised his hands, sorry for only one thing: his death would multiply his mother’s grief. Wow! I'm hooked. How can readers find you on the Internet? Welcome back, Tricia. Why do you write the kind of books you do? I write about things that inspire me—stories, people, events. I also write stories that I hope will inspire others to consider how they can do something extraordinary with their lives. The most recent “happiest day” was my son's wedding day—July 9th. First, because our family was together—all of my four kids! Second, because we got a new member of our family, my new daughter-in-law Katie. She's amazing. Third, because my son had done things right. He followed God and has lived a pure life. It was something to celebrate! A fourth because I was able to spend the day with so many family and friends in Montana. I used to be super neat and very “together” … now I'm a mess. LOL. No seriously, I've grown as a person and I'm learning what's really important. Having my house perfectly clean is NOT. Writing a story that will draw people closer to God is. Spending time with my family is. Loving on readers is. I'm currently working on Praying for Your Future Husband. It's a book for teen girls co-written by my friend, Robin Jones Gunn. I'd love to fly into Madrid, Spain, and drive through Southern France, Switzerland, Austria, Hungary, Slovakia, Poland, and ending in my favorite country The Czech Republic. I've either had books set in all those places (bold), or I want to write about those places! I start with an interesting conflict—mostly war—are go there in my story. The great thing about the places I pick is they're amazing places with interesting cultures, even without the war. Vienna, Prague, Seattle, prairie Montana are places I'd visit just because. Besides my kids (I'd always pick them first), I'd pick Tyra Banks. Interesting choice, huh? I feel Tyra is “this close” with her message to teens about self-imagine, believing in themselves, etc. I'd love to absorb some of her business smarts and speak a little of my heart about how Christ—and following Him—is the missing part of her message. I love entertaining—having people over, talking, playing games, chilling. I also love traveling and even being a tourist in my own town! You live in my old stomping grounds now. What is your most difficult writing obstacle, and how do you overcome it? The most difficult obstacle was when I thought I was getting a 3-book contract for more WWII novels with my first publisher, but then that fell through. I was crushed! I overcame it by focusing on God and asking His plan. I discovered He had other things for me to write. I'm still writing WWII, but I also write about so much more. Attend a writer's conference! There is nothing that can replace face-to-face contact with other authors, agents and editors. It's always a pleasure to have you on my blog, Tricia. Here comes another wonderful Christmas novella collection from Barbour. We'll talk to Eileen Key first. How did your story for the collection come about? I was invited by Cynthia Ruchti to join the novella group. Me, a Texan! Texans are good writers, too. I'm a Texan. What are you reading right now? I’m reading Ronie Kendig’s book, Nightshade. I love Ronie's book. What other books have you written, whether published or not? My first book was a cozy mystery: Dog Gone. The novella came second. My next cozy is with Avalon and doesn’t have a scheduled release date. Don't forget to let me know when you get that pub date. We'll feature it here. What is the hardest thing about writing a part of a novella collection? The timing! Moon phases, snow depths, landscapes. What a fun group! We’ve formed friendship though this endeavor. Through strife and stress, the group pressed on, praying for one another daily. That's the best way. How do you choose your characters’ names? I try them on my tongue first. I like them to resonate with me. Graduation programs are great for that! Love can happen in the twinkle of an eye when the Lord sends someone your way. Yes. ACFW is my support group of choice! I’ve formed lifelong friends there and learned most all I know about the craft through them. In 2003, Tracy Peterson told me to keep writing. I did. http://www.eileenkey.com/ and of course on Facebook! Thanks, Lena! I appreciate what you do for all of us. My pleasure, Eileen. Now we're going to talk to Becky Melby. How did your story for the collection come about? One of the things Door County, Wisconsin, is famous for is theater, so my first thought was to create a comedy dinner theater staffed by some fun, oddball characters. I had to invent some conflict for this troupe, so I stirred things up with a little betrayal and a destructive thunderstorm. Now I needed someone to save the day. Enter Jillian Galloway, niece of the theater’s owner, who thinks she’s come to Door County to savor the fall colors, heal from her broken heart, and use her advertising degree to promote Door Buster’s Comedy Theater. Of course, she finds out otherwise. And, since this is, after all, a romance, the most delightful part was creating my hero. I wanted someone who seemed out of place in the colorful landscape soon to be covered with snow. So into this peninsula first inhabited by Scandinavians, I brought Ricky Jimenez...dark, mysterious, with a knee-weakening Brazilian accent. Ricky holds the only key to Door Buster’s future, but Jillian is warned not to trust him. And that’s when the fun begins! Sounds like my kind of story. What are you reading right now? Books on the Underground Railroad for research, The Testament by John Grisham, and John Piper’s What Jesus Demands from the World. Oh, and I love starting the day with Oswald Chambers’ My Utmost for His Highest. I loved, loved, loved The Testament. What other books have you written, whether published or not? With four stories set in the same county, we had to divvy up all the fabulous things to see, do, and taste! There was such amazing teamwork with these ladies—anytime it appeared two of us had scene elements that were too similar we easily worked out the details. Number one: I made new friends! God miraculously worked out the details for the four of us to meet in Door County, Wisconsin, to plot out our stories while experiencing the sun setting in Peninsula State Park, the quaint lighthouse pictured on our cover, a beautiful Bed & Breakfast, and local delicacies like stuffed French toast and a (warm cherry and hot fudge) Door County Sundae. Laughing, praying together when the power went out, and sketching out stories with these women was a precious gift. Can’t wait to see all three beautiful faces at the ACFW conference in September. I’ve had my main character’s first name tucked away in a mental file since I saw Ann Jillian in a movie—maybe twenty years ago. I needed a Latin name for my gorgeous Brazilian and Ricky Ricardo came to mind! For my secondary characters, who are truly characters, I brainstormed names that would fit their personalities...Buster, Mort, Wilma, Huey, and Ardis. Baby name books and Web sites are great helps. The takeaway I hope readers grasp in every story I write is that God is the granter of second chances. In Christmas Crazy, Jillian is licking her wounds and pride after a break-up, Ricky is running from a life that pulled him away from God, and Uncle Buster is on the verge of losing his business and his miniscule shred of faith. I hope their stories will infuse readers with a desire to persevere and trust in God’s perfect timing. Yes. The writing life can be lonely. Through ACFW, I have made dear friends who speak the same “language.” At the first conference I attended, I connected with two other writers in the first hour at the hotel. By the end of the conference, we’d formed a critique group. Their help has been invaluable. I’ve learned so much in the online loops and I can tap into this bottomless well of knowledge for information on any topic under the sun. I love feeling connected, rooting for other writers, celebrating victories, exchanging encouragement in times that feel like defeat, and knowing there’s an extended family always available to offer advice and prayer. As I began pondering this question, my gaze shifted two inches to the right of my computer. A white mug sits on a Texas Bluebonnet coaster. Both are gifts from my Door County Christmas sisters. The side of the mug facing me reads “Write Anyway.” That pretty well sums up the best advice I’ve ever received! I love those tingly muse-moments when a bit of dialogue or a story line wakes me in the middle of the night demanding to be written. But if I were to write only in those glorious moments, I’d be cranking out about eighteen words a week! At that rate I may produce one full-length novel before I succumb to senility. Instead of waiting for the muse, five days a week I plunk my backside first in my prayer chair (“Start with prayer” may actually be the best advice!) and then glue that part of my anatomy onto my desk chair. Often, the first few sentences seem flat and uninspired, but as I reacquaint with my characters and God honors my plea for fresh ideas, the story comes alive in my head all over again. Thank you so much for this opportunity, Lena. My pleasure. Here comes Rachael. How did your story for the collection come about? Many romances include conflicts that involve parental resistance. I thought an interesting twist in a Christmas romance might involve opposition from Grinch-y grown children who would not want their widowed parents’ romance to bloom. My female and male lead characters in Ride with Me into Christmas share an interest in cycling, as my husband and I do, which worked well in Door County’s beautiful vacation setting. I also placed them on a tandem bicycle for the first time, and like us, they learned lack of communication and cooperation can mean a crash! I’m reading DiAnn Mills’ Breach of Trust. What an addictive book! It’s a good thing I can classify reading as “research,” because I can hardly quit reading it to work. In my Bible study, I’m reading the book of Nehemiah. What practical, yet deeply spiritual wisdom I’m learning from its pages! Nehemiah, a man of prayer and action, knew how to follow God. I love that series of DiAnn's What other books have you written, whether published or not? I’ve published four Heroes of the Faith biographies with Barbour: Frederick Douglass, Billy Sunday, St. Augustine, and It Is Well with My Soul, a collection of hymn writer mini-biographies. I co-authored Women of the Bible (Barbour) with Carol Smith and Ellyn Sanna, which will release in February 2011. Unpublished: I’ve finished writing a women’s fiction, Kneady Women, a book about an off-beat group of bread bakers called the Loafers, that I just sent to my agent. I’ve also written a YA historical, Song of the Orphan Train, that won the Genesis YA in 2007. I wrote The Refuge, a suspense, a few years ago. I'd love to feature your Women of the Bible on my blog. What is the hardest thing about writing a part of a novella collection? Becky, Cynthia, and Eileen are such team players that even the more difficult aspects went well. 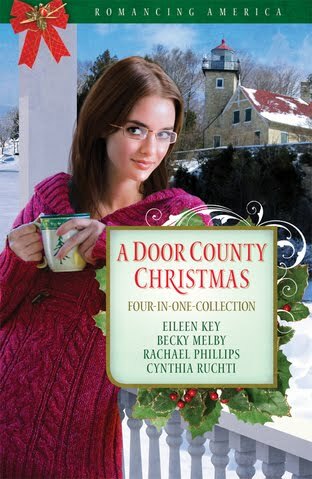 With all our stories set in Door County, WI, we made a special effort to ensure our characters, plots, settings, calendars, clocks, and weather didn’t overlap or sabotage those of our partners—e.g., when one author needed major snowfall the week before Thanksgiving, another didn’t have her protagonist running around in shirtsleeves. We met for a few days in a Door County, WI, bed and breakfast to get to know each other and work out the details, as well as the main points of our plots. I wish every first fiction author could work with such a fun, knowledgeable, creative group. I knew Cynthia before we became novella-writing partners (it was she who approached me), but I did not know Becky or Eileen. Not only have they become good friends, but all of them have taught me so much about writing fiction and working with editors and publishers. The only negative aspect? We all like Door County Hot Fudge and Cherry Sundaes way, way too much. Now you're making my mouth water. Wish I could taste one. How did you choose your characters’ names? Joanna and Paul, like many of my characters, appeared in my imagination already named. I did take note of the era in which they were born (1940s) and checked websites such as the Social Security page of baby names http://bit.ly/92jLUZ ). Cynthia suggested Joanna’s last name, and I chose Paul’s Scandanavian-sounding name, Sorensen, because the action takes place in Wisconsin. I often check phone books for names. Originally, Joanna’s son in the novella was named David. But after I finished the book, I wasn’t sure my son—also named David—would appreciate it. So I changed him to Andrew. Thank the Lord for the “search” button on the toolbar! Absolutely. In this organization, a fiction writer finds career opportunities, endless educational, spiritual, emotional support—and just plain fun! An author also learns how to serve and share the good things God has given us writers. My Web site is http://www.rachaelwrites.com/ . I’m on Facebook and also have another Facebook page, Rachael M. Phillips, Author (http://bit.ly/cbJQ01 ). I’m on Twitter (http://twitter.com/rachaelmphillip ). Aren't we having fun? The only one left to visit with is the president of ACFW, Cynthia Ruchti. Welcome, Cynthia. How did your story for the collection come about? Years ago, shortly after I joined ACFW in 2002, I wrote a novella about a woman who escaped to Door County, Wisconsin, (one of my favorite places to visit) to heal from a painful relationship. Original, huh? The novella served as good practice for me and yet it wouldn’t stay put in the file where I’d stuffed it. The location is charming. The characters charmed me, too. My thoughts kept returning to that story. In 2008, shortly before the ACFW conference, a Wisconsin author friend—Becky Melby—who also appreciates the unique appeal of both the rugged natural beauty and the quaint shops and artisans of Door County brainstormed with me about a project we could collaborate on. A Christmas novella collection! With an endearing balance of romance and comedy, two things in which Becky excels. Ideas began to hum, but we needed two more voices for our quartet. 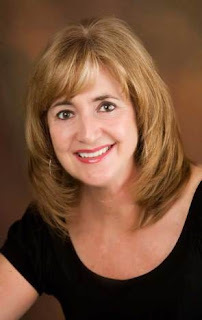 Two other ACFW authors came to mind: Eileen Key, a Texas author with little experience with snow and cold (Oh, would it be fun to thrust her into that environment! ), and Rachael Phillips (an Erma Bombeck award winner), a Midwest author familiar with snow as well as non-fiction author working toward a fiction contract. Our quick brainstorming sessions via email produced four distinct yet related storylines. I’d hoped to resurrect my original Door County story. How easy would that be? All I had to do was make it funny. And better. I didn’t know whether to be surprised or grateful that I’d grown so much as a writer since 2002 that The Heart’s Harbor in A Door County Christmas (Barbour Publishing) bears little resemblance to the original. Right now I’m reading middle grade historical stories written by my agent, Wendy Lawton. I admire her attention to research details and the wealth of literary information she carries in her brilliant mind. Like many writers, I have complete novels collecting dust. I have others pounding the pavement, looking for employment. My debut novel—They Almost Always Come Home—released in May from Abingdon Press. It’s been gratifying watching it find its way into the hearts of readers. The four of us authors found ourselves thinking so in sync that during the critiquing portion of our collaboration, we’d discover we’d chosen a similar way to describe eye or hair color, or we’d used a clever phrase we’d thought was our own. It made us laugh and thumb wrestle for the privilege of using the phrase. Some novella collections are written with little interaction between the team members. We decided early on that we wanted to be engaged with one another and each others’ stories. We worked hard to keep threads of continuity without stepping on each others’ plot lines or character quirks. We wrote and critiqued chapter by chapter and kept each other to deadlines but applied grace where needed. We prayed for and with one another, and bonded on a research trip to Door County to make sure we got the details right. The level of comfort we felt with one another strengthened our stories and us. I consider age of the characters, a mood I’d like to convey, nationality, and often the meaning (whether subtle or obvious) in the name. I especially enjoy choosing names for sidekicks and neurotic dogs. Even though The Heart’s Harbor is a Christmas story and a love story and a humorous story, my prayer is that readers will also catch the underlying concept that sometimes healing comes through serving… and that Ernine is a mighty fine name for a camel. I’m a member of ACFW because they wouldn’t let me be president if I wasn’t! That, and the fact that ACFW is THE place to be if you want to learn how to write Christian fiction and produce novels that are both God-honoring and skillfully crafted. ACFW has provided training I needed (and still do) and camaraderie I craved (and still do). I had a desperate need to grow in my understanding of the industry and credit ACFW with pointing me in the right direction. The networking and friendships I’ve gained bless me every day. That is so true. What is the best piece of advice you received as an author? Before I knew how important it would be, I was told not to believe the best things said about my writing, nor the worst. Great counsel. I write stories of Hope-that-glows-in-the-dark, a tagline that has proven itself fitting in everything I’ve written to date, whether the subject matter is heavier, as in They Almost Always Come Home, or more lighthearted, as in The Heart’s Harbor in A Door County Christmas. 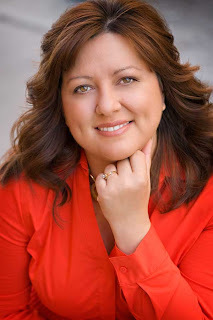 So readers can find me at http://www.hopethatglowsinthedark.com/ or http://www.cynthiaruchti.com/. 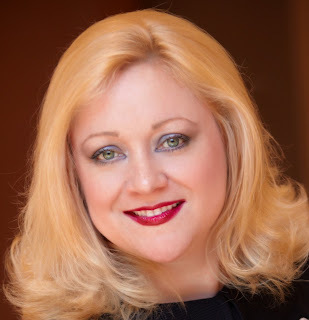 I love to connect with readers and writers on Twitter and Facebook, too. What a fun group you've been. Thanks for visiting my blog. I'm thrilled to have Julie back on the blog. What are some of the spiritual themes you like to write about? Oh, wow, I absolutely LOVE to write about spiritual themes that relate to marriage, because I have learned SO much the hard way in my 32 years with the love of my life! I long to pass all I’ve gleaned onto young women today and maybe save them some agony in the process. Well … in exactly ONE WEEK, the first book in my “Winds of Change” series A Hope Undaunted officially releases, although it is available on CBD.com as of three days ago and is probably available in stores now as well too. The next book in the series, A Heart Revealed is written but won’t be released until September 2011, followed by the final book in the series (and the final book about the O’Connors!) A Trust Restored (working title), September 2012. Probably Francine Rivers because she is not only one of the best authors in the Christian market, but she is one of the most humble and godly women I have ever had the pleasure to meet. I would LOVE to pick her brain on spiritual matters that relate to writing. I was able to visit with her several times when she was the speaker at the first national ACFW conference in Denver. What a blessing! What historical person would you like to meet (besides Jesus) and why? Well, anyone who attended the 2005 American Christian Fiction Writers Conference will remember me as the poor slob who waved her hands wildly in the back of the room when Brandilyn Collins asked who had the most rejections in a year. I won hands-down with 19 (at that time) and went on to garner 45 (both agent and publisher rejections, including three received AFTER I signed a 3-book contract with Revell Publishing!). Even my agent, Natasha Kern, blanched a bit when she first signed me, realizing after the ink was dry just how many times I’d been rejected. I believe the word she used was “daunting.” But apparently not too daunting for her amazing skills as an agent because she landed a contract for me within six months. Despite 45 rejections, A Passion Most Pure went on to win ACFW’s 2009 Debut Book of the Year and the Holt Medallion Award of Merit, which STILL blows me away! So to all the aspiring authors out there—don’t let those rejections have the final say! For me the trick was to praise God in the face of every single rejection, eyes fixed on HIM instead of myself while I continued to press on. Also, because of the struggles I encountered on the road to publication, I compiled a whole lot of Scripture prayers that I wrote specifically for writers, so I encourage any writers out there to print off a copy from my website at http://www.julielessman.com/from-the-heart/ . The 1920s are drawing to a close, and feisty Katie O'Connor is the epitome of the new woman—smart and sassy with goals for her future that include the perfect husband and a challenging career in law. Her boyfriend Jack fits all of her criteria for a husband—smart, good-looking, well-connected, wealthy … and eating out of her hand. But when she is forced to spend the summer of 1929 with Cluny McGee, the bane of her childhood existence, Katie comes face to face with a choice. Will she follow her well-laid plans to marry Jack? Or will she fall for the man she swore to despise forever? Sounds like anothre winner, Julie. Please give us the first page of the book. Gladly! Now keep in mind that this is the first page of my galleys, which always have more copy than the final printed page. Now this is how love should be—nice and neat. Katie O’Connor sucked the last of her Coca-Cola through a straw in Robinson’s Diner and studied her steady beau Jack Worthington with a secret smile. No, siree, no dime-novel notions of love for her. Love requires a focused plan, she thought to herself with certainty. Cool, calm, rational thinking, not a moment in time where one lovesick glance seals your fate. With a loud, hollow noise, she drained her soda and pushed the glass away, assessing Jack through approving eyes. Her lips slanted. Love at first sight, my foot. She noted the dimple that deepened on his chiseled face as he delivered a punch line with a boyish grin, and a satisfied smile tilted the corners of her mouth. Falling in love was for fools—blind fools, she reflected with all the mature assurance of her eighteen years. Let other girls “fall” in love with their eyes closed, but not her. No, she preferred to be in control and walk—not fall, thank you very much—into true love. And if she had her way—which she fully intended to have—it would be with a man who was everything on her carefully crafted list. Laughter disrupted her thoughts, and she found herself grinning along with the two couples sharing their booth as they roared at the finish of Jack’s joke. As usual, Jack’s buddies made a ruckus whooping and pounding their fists on the table in glee, and Katie couldn’t help but sigh with contentment. Good sense of humor. She mentally checked a box on her list and quickly scanned the cozy shop with its black-and-white-checked décor, grateful they had it to themselves at this late hour. Jack and his friends tended to get a bit rowdy, but they certainly knew how to have a good time. She settled back against the red-leather, high-backed booth and shot a glance at the marble counter where a lone soda jerk polished chrome mixers to a gleam. “For crying out loud, Katydid, you inhaled that soda! And I bet I’ll have to buy you another, won’t I? I’m not made of money, you know.” Jack draped a sturdy arm across her shoulder and pulled her close to his handsome face. The glimmer in his dark eyes matched that of his deep brown hair, stylishly slicked back with Brilliantine. “Or maybe I am,” he teased. I can hardly wait for my copy to arrive. How can readers find you on the Internet? At my website at http://www.julielessman.com/ , where I talk to my readers every day via a new feature I call “Journal Jots,” or at my group blog, The Seekers at http://www.seekerville.blogspot.com/ . Thank you, Lena, for hosting me on your blog, and I can’t wait to give you a big, ol’ hug at ACFW, my friend! And thank you, Julie, for giving us a peek into your life and your new book. See you at the chocolate party!